Our Park Snooze and Fly Package includes 2 weeks of free parking at the hotel near Boston - Logan International Airport while you're enjoying vacation and a one night's stay at Four Points Sheraton Boston Logan Airport the night before your flight. Alternatively, we can provide hotel accommodations on the night of your return. Lastly, shuttle transfers will be provided to Boston - Logan International Airport when you depart and transfer you back to Four Points Sheraton Boston Logan Airport upon your return so you may get your vehicle. If you have a late landing, staying the night of your return is also an option. You can take advantage of parking your car at the hotel prior to your flight and getting well rested at the hotel the night of your return. Our Park Snooze and Fly Packages are an excellent way to make airport parking convenient and affordable. 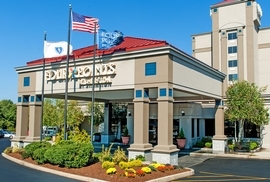 The Four Points Sheraton Boston Logan Airport allows late arrival check-in so you know your room will be ready even if you have a late landing. If you need more parking than the included free parking at the Four Points Sheraton Boston Logan Airport, you may extend the parking duration for an additional fee of (15.00 Per Additional Day) paid to the hotel. Four Points by Sheraton properties are the third-largest brand under Starwood Hotels and Resorts. 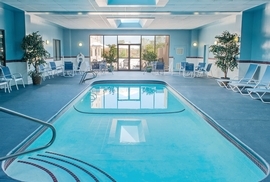 This mid-size hotel brand is typically full-service, featuring restaurants and lounges, and several included amenities are free Wi-Fi and free bottled water. Each Four Points Sheraton has an individual personality, and is both popular and highly rated above other mid-size hotels by critics. These hotels are interior corridor and are ideal for business and leisure travelers alike. Comfort, relaxation, and great service are components experienced by guests who stay at Four Points Sheraton properties. Click here to see all of our Four Points Sheraton hotels which we offer in alternate cities. Transfer Note: Every 30 minutes 2am-12pm, then on demand. Indoor Pool - Yes - Closed for renovation through approximately 04-30-19.